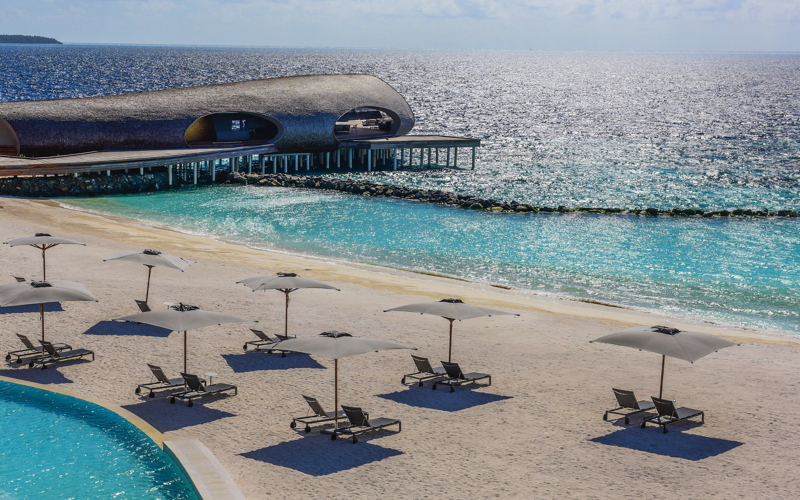 St Regis Vommuli Resort in the Maldives is a small luxury 5* resort in the Dhaalu Atoll, a 45 minute seaplane flight from Malé Airport. Set on 9 hectares of lush tropical gardens, powdery white sand and turquoise lagoon. Combining contemporary design with local craftsmanship and a real appreciation for the environment. A personalized St Regis Butler Service is available for all the 10 room types. 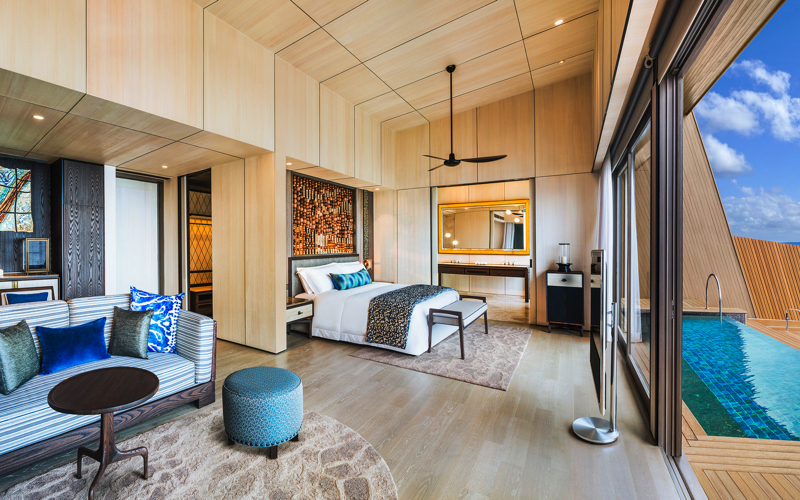 The spacious villas and suites come with a private pool, iPad room controls and floor-to-ceiling windows. The rooms also include a walk-in closet, private terrace and Bang & Olufsen BeoVision TV. The marble bathrooms come with freestanding bathtubs and rainforest shower. From 1 bedroom beach villas to a 1 or 2 bedroom overwater villa to the amazing 3 bedroom oceanside villa with its own 92 square metre infinity pool. You can dine at 6 very different restaurants serving up sophisticated dishes from around the world. Choose from Italian, Chinese, Japanese, Indian, and a pop-up diner, serving gourmet street food. 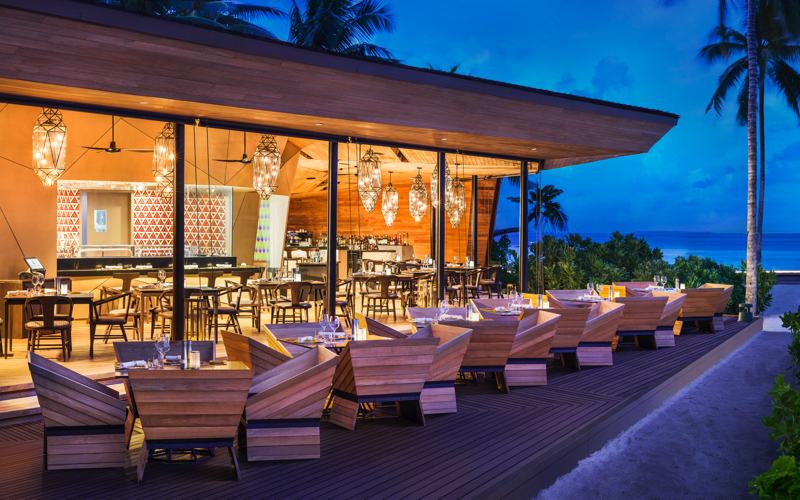 The Whale Bar is the overwater destination for enjoying delightful tapas and cocktails while watching the sunset. Decanter, is the opulent underground wine cellar, where you can eat a customised 5 course menu with 7 perfect pairings of vintage wines. St Regis Vommuli Resort boasts a crystal clear turquoise lagoon and a house reef with colourful marine life. Go snorkeling straight rom the beach and discover the resorts house reef. The dive centre offers an extensive choice of diving packages dedicated to tailoring to all your personal diving needs. Take a Digital Underwear Photographer course, rental camera and pen drive included. Youngsters aged 8 to 9 who wish to discover the wonders of the ocean are welcome to join the Bubblemaker course, under the guidance of their trusted experts. 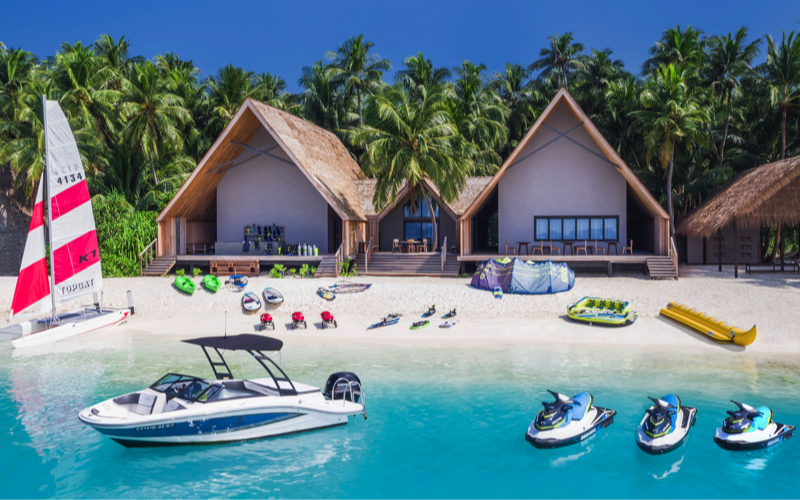 The water-sports centre also offers windsurfing, jet skiing, sea bobbing, glass bottom kayaking and catamaran sailing. Go all out and charter their yacht or take their speedboat out to explore the surrounding islands. The Iridium spa at St Regis Vommuli Resort is perched over the water. 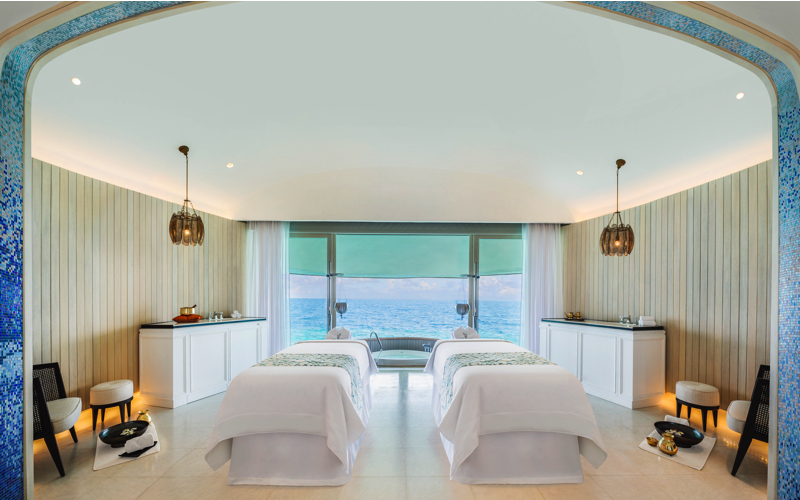 From Balinese and Thai massages and herbal body scrubs to facials, manicures and pedicures there is a treatment to leave you feeling refreshed. The Blue Hole Pool is the most expansive hydrotherapy pool in Maldives. Heated seawater and an array of whirlpool jets melt away your tension whilst offering curative benefits for both mind and body. also on offer are such as acupuncture, meditation, anti-gravity yoga. The Yoga and Meditation Studio offers a variety of group or individual classes. There is also the resort’s state-of-the-art fitness centre with a variety of equipment. 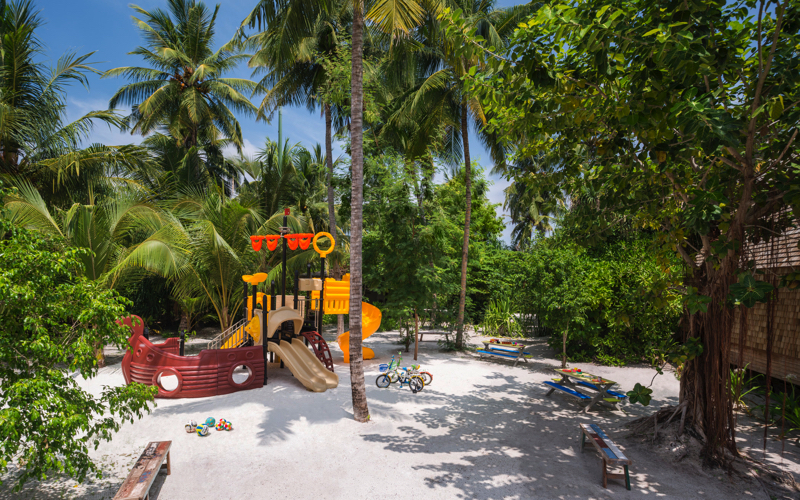 The Children’s Club at St Regis Vommuli Resort offers a variety of engaging activities for your children to enjoy, with compliments. The infinity pool makes a perfect place for families to spend time together. Pool attendants are happy to provide pool toys, sunblock, snacks and more. The activities co-ordinator can arrange fun activities such as table tennis, air hockey, and video games at the Children’s and Socialite Clubs. a baby-sitting service is also offered.